A fleet of ten marine robots has successfully completed an ambitious two-week mission off northwest Scotland, despite being hit by a succession of Atlantic storms with winds gusting up to 60 mph and waves up to 7 m high. 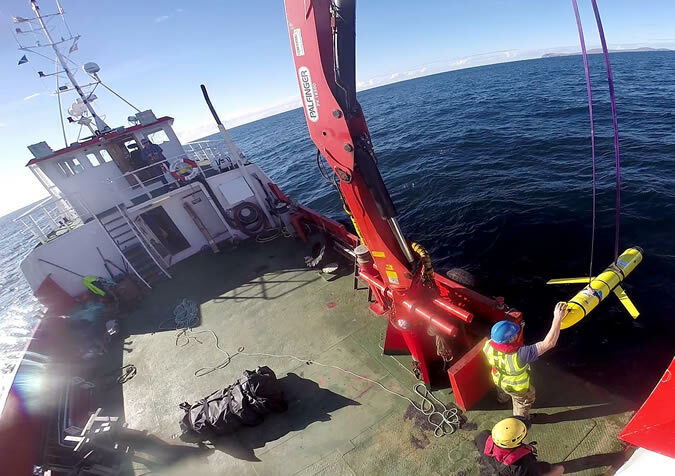 The mission comprised the largest simultaneous deployment of marine robots yet attempted in UK waters, with seven submarine gliders and three surface Wave Gliders operating in challenging waters around the Outer Hebrides. The robot fleet was collecting a variety of marine environmental data including ocean temperature, salinity, oxygen, turbidity, tidal currents, and surface weather and wave conditions. While the robots were taking a battering from the weather, the mission pilots and scientists were safe and warm operating the fleet via satellite from the comfort of dedicated operations rooms. 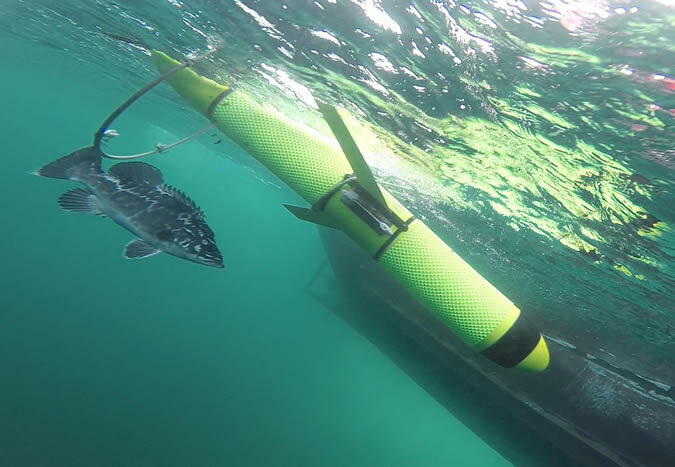 The submarine gliders surveyed an area of over 5000 km2 during the two-week deployment, venturing up to 125 km offshore of the island of Barra into waters over 1000 m deep. The Wave Gliders ventured up to 150 km north of the island of Lewis, each covering a distance of more than 300 km. The ability of the Wave Gliders to accurately target features such as oceanic fronts, visible on satellite images provided by Plymouth Marine Laboratory, was a particular success given the combination of strong winds, waves and tides. The mission was co-ordinated by the National Oceanography Centre (NOC) in partnership with the Scottish Association for Marine Science (SAMS), and involved over 20 industry and government partners. The UK Defence Science and Technology Laboratory (Dstl) was theprimary sponsor of the mission, which was in support of the Royal Navy’s ‘Unmanned Warrior’ programme, and all of the collected data will be archived at the British Oceanographic Data Centre and made available for future scientific research. Prof. Russell Wynn of NOC, who was Chief Scientist of the mission, said: “This mission benefited hugely from the local knowledge at SAMS and the offshore expertise provided by the Royal Navy, which enabled us to safely deploy and recover the ten vehicles in difficult conditions; it also highlighted the ability of marine robots to continue collecting high quality data in sea states that would have hampered or even terminated traditional vessel-based observations. Fraser Macdonald, who co-ordinated the SAMS contribution, added: “SAMS has a long history of working in this region, and the unique glider data collected during this mission will contribute to our ongoing research into the complex oceanographic processes that influence changes in global climate, including how increasing ocean temperatures are affecting the northeast Atlantic and adjacent regions including the Arctic”. The deployment was the third in the ‘Exploring Ocean Fronts’ programme, which started in 2014. The programme seeks to inform the scientific and environmental community, as well as industry, of the benefits of these new technologies as an alternative to manned vessels, which are relatively expensive to operate and have a larger environmental impact.